You are met with hard soil. The earth is rutted and littered with the stills of life. A shopping cart is nearly buried with a patch of grass emerging from within next to a wilted park bench engraved with Frankie Knuckles, 2PAC, and the colors of UNIA. A mural of Michael Jackson looms large on the wall directly behind, framing the five-square-feet of space as a memorial of the black musical vanguard. And this is just the first few inches of Henry Taylor’s solo exhibition at Blum & Poe in Los Angeles. Taylor’s installation, a series of distinct landscapes, manifests sects of the city, of memory, and present life in a topographical montage. 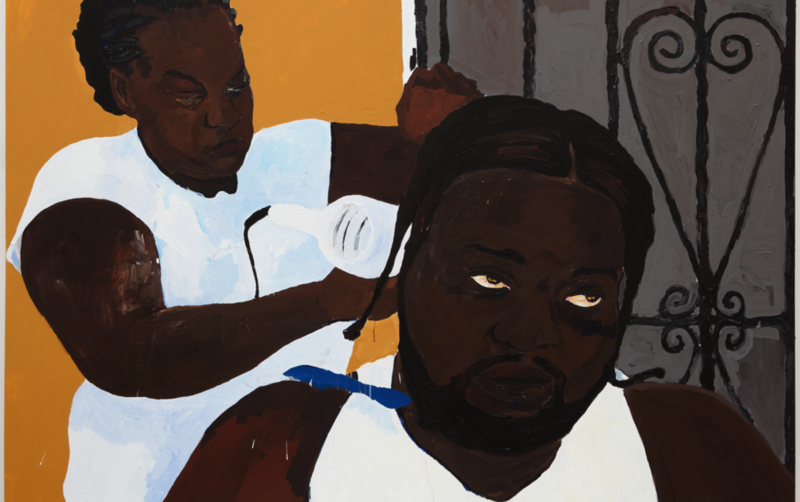 Black folks are the subjects, which strew the walls in these varying rooms, appearing on canvas and film as solo figures and kin, as posed and observed citizens of Taylor’s vision. The initial gallery is a nearly barren lot with life persisting in pockets of isolation. A wall of cinder blocks, unfinished and/or disintegrating, is covered in graffiti with a tent revealing its very top just over the ledge. Behind the wall the tent is open with the objects of someone’s life—an air freshener, beer, sleeping bag—gathered at the entry. Eroding bikes graze the tent and are stacked against the cinder blocks and a tree that is no longer thriving erupts from the ground. This is Los Angeles and Oakland, Detroit and New Orleans. This is the materiality of urbanity and the endurance of living within the arid cityscape. This facet of life and living as insistent in spite of abundance works in conjecture with the portraits of black folks, which rest against the walls. Taylor figures hairstyling, children and elders, and watching citizens within this world. This initial lot ends at open white gates and a room of lush grass. This next landscape has a pool with floating noodles at its center and portraits of black folks in various states of leisure on the walls. The distinction between grass and dirt, between water and desiccation, between private excess and public lack is palpable. This too is Los Angeles and Oakland, Detroit and New Orleans, the revitalized city and the tenants of the last several decades who have been forced into decline. 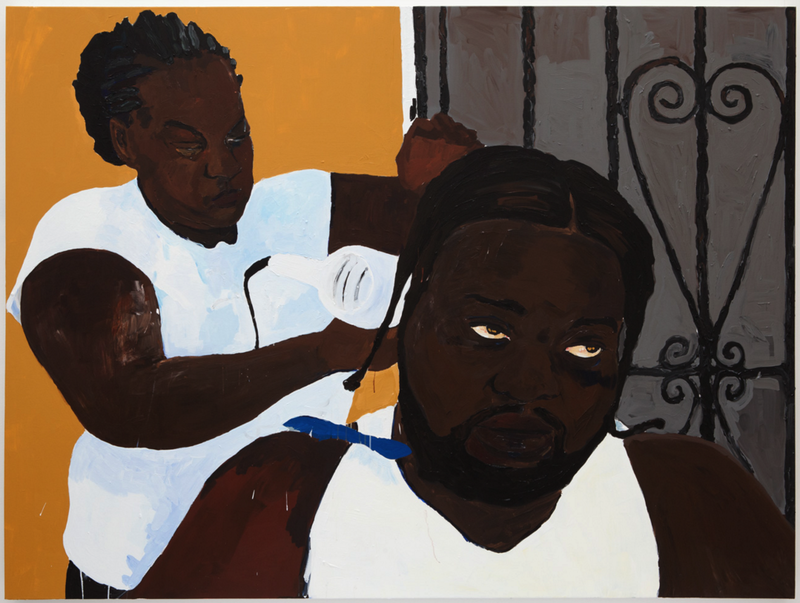 Taylor’s investment in blackness as heterogeneous—in class, in hue, and locality—insists upon the complexities of black life of black people within the visual scape of the city that was/is. The third scape exhales sage into the whole of the Blum & Poe. A dark room with folding chairs against the wall and a card table at center a film projects from two walls. 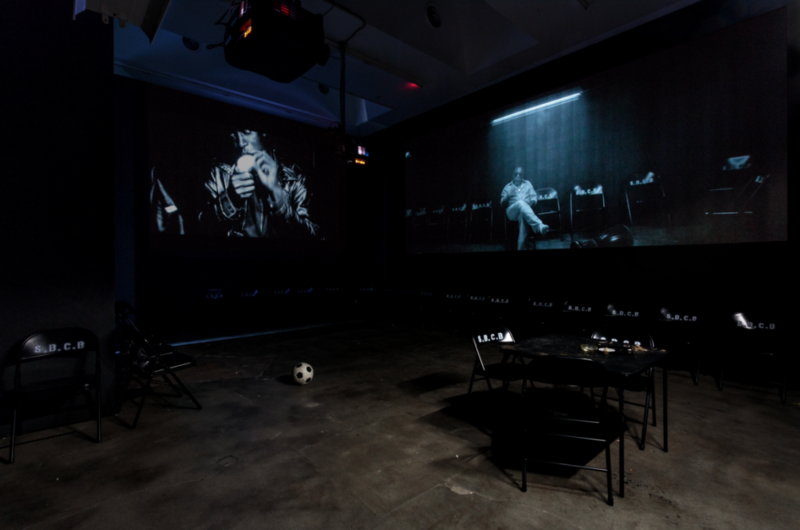 Filmed in the same room of the installation, dreadlocked men sit in trance and conversation with smoke filling and moving from the screen. A tonal voice dissipates into an ethereal frequency and the scene of Rastas projects simultaneously and then singularly on either wall. Created by Kahlil Joseph in collaboration with Taylor, the film and performance, which occurs on Saturdays, is a musing on an encounter the artist had with Bob Marley in the late 1970s. 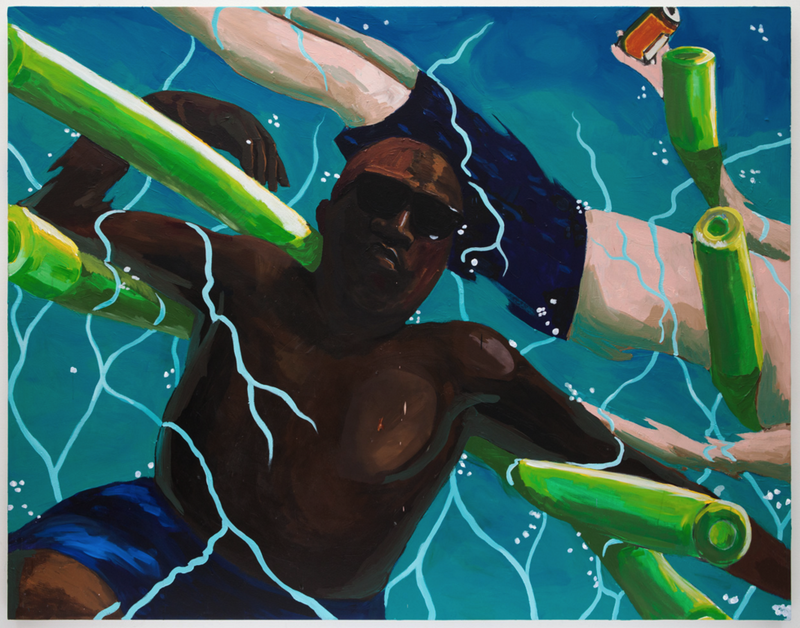 Joseph’s capture of Taylor’s meeting is a cinematic landscape of black diasporic collective and fluid memory. 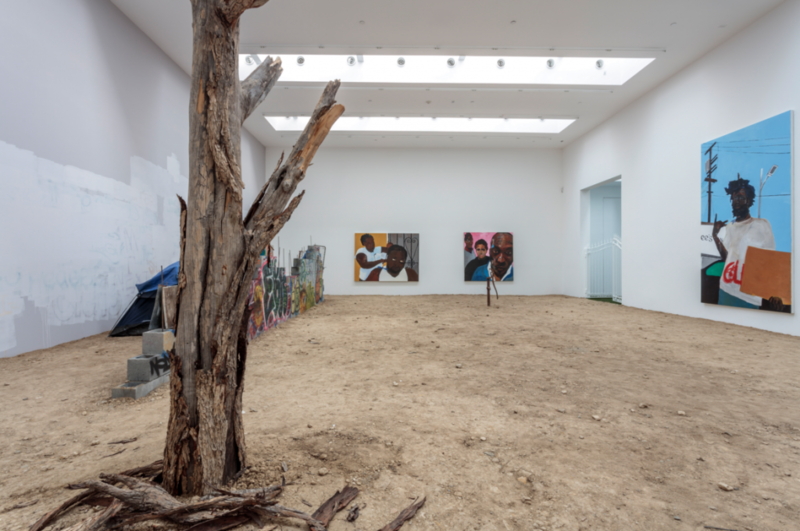 In all, each gallery, each sphere is Taylor’s memorialization of time and place and the movement of blackness—as populace, as artifact—within it. Essence Harden is mixed media artist, PhD student, and writer from Oakland, CA. Her work queries blackness, masculinity, pleasure, hair styling, and il/legibility. Essence currently resides in Los Angeles, CA.